When we were planning for the renovation, while I felt that curtains/blinds were a must for the living room and bedrooms, the hubby and I were hesitant if we needed outdoor roller blinds for the balcony. We were told by the previous owner that the rain didn't really splatter onto the balcony and that they hadn't had any issue so far. The thing is, since we have a spacious balcony and we do not have a dryer, this will be where I will be hanging up the laundry to dry. Just so you know, we have to do the laundry almost every day and it's a huge part of my stay-at-home mum life now (I still don't get it why the kids wear so many outfits in a day). In addition, since we don't have a storeroom, we will be placing a storage cupboard and all the kids' bicycles and scooters in the balcony. Thus, these reasons were enough to make me decide that yes, I think we need those outdoor roller blinds. It turned out to be the right choice because guess what? The first time that we experienced a heavy downpour and strong winds after we shifted in was also the day that my balcony became half wet. Yup, the rain does splatter (and not just a little) and I conclude that the previous owner probably didn't keep anything much or hang any laundry on the balcony. 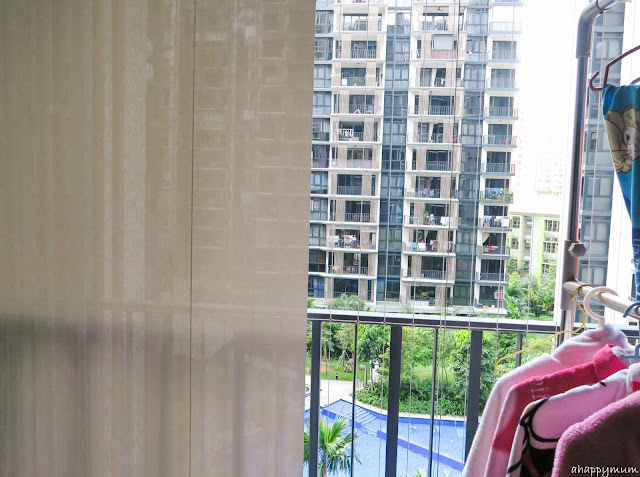 So, we eventually did our curtains for the master bedroom and living room, roller blinds for the kids rooms and outdoor roller blinds for the balcony with Meridian Curtains & Furnishings (Read our experience on invisible grille with Meridian here.) Here's a look at the installation process and you can see what blinds and curtains we chose for each of the rooms too! We were told that the installation of all the curtains and blinds would only take half a day - or in fact, around 4 hours. 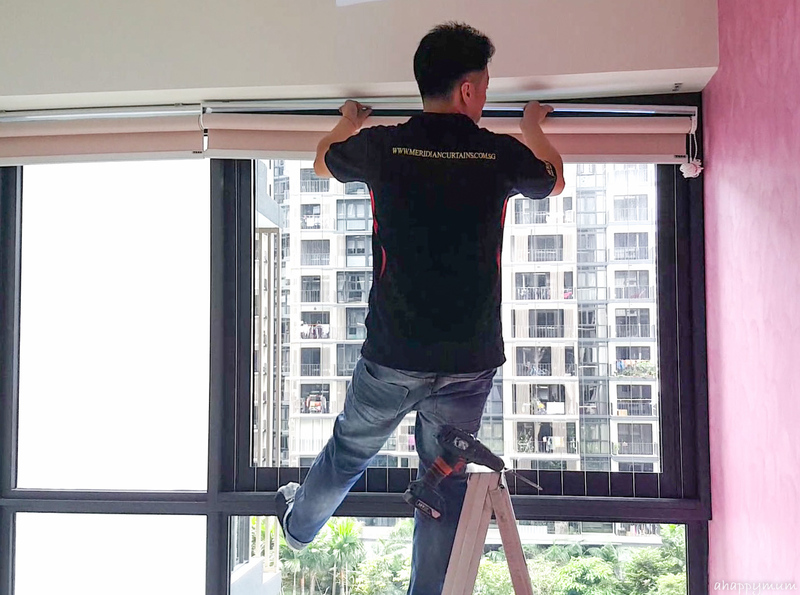 It ended up that we ran into problems and the outdoor roller blinds couldn't even be completed after the first day. Why? 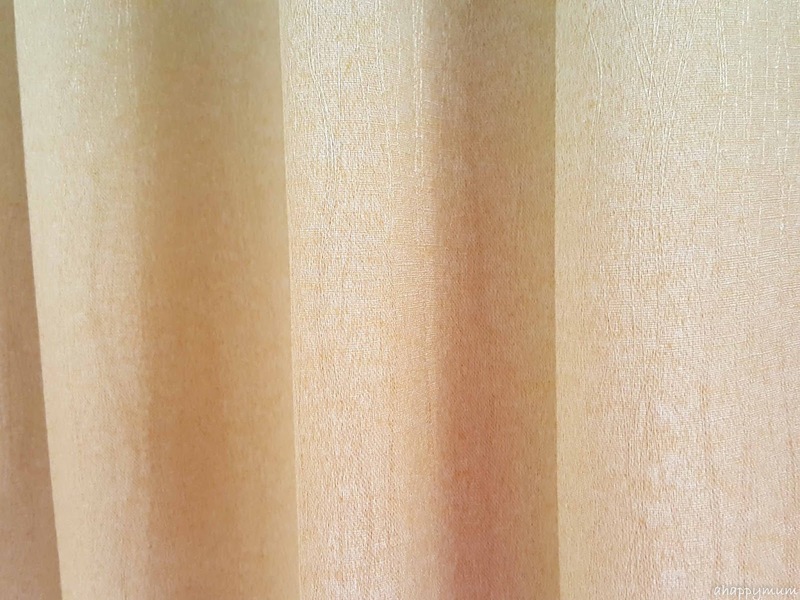 It was because after the workers had made markings, drilled all the way and tried to fix the blinds that they came to realise that the ceiling was sloping quite badly and one side was 2.5" taller than the other. This made it impossible for them to put up the blinds and even if they managed to, we wouldn't be able to draw them smoothly too. To be fair, our balcony is quite huge maybe it could easily have been an oversight. The workers told us they would now have to add brackets and hang the blinds onto the brackets instead so they can be parallel to the ground (which also means that one end will hang at a greater distance from the ceiling than the other). This meant that all the holes they had drilled were useless and had to be patched up and repainted, which was what dismayed me because we could have saved the hassle if they had used a professional levelling instrument to first detect any sloping ceiling before commencing work. I was also not entirely satisfied with the touching up because there were areas with markings or hair from the paintbrush left on the ceiling. Thankfully, a quick feedback to Meridian was promptly followed up with a second round of touch up and everything was resolved eventually. Phew! The outdoor roller blinds come in a standard colour as per dictated by the condo management, so we didn't really have a say in it. 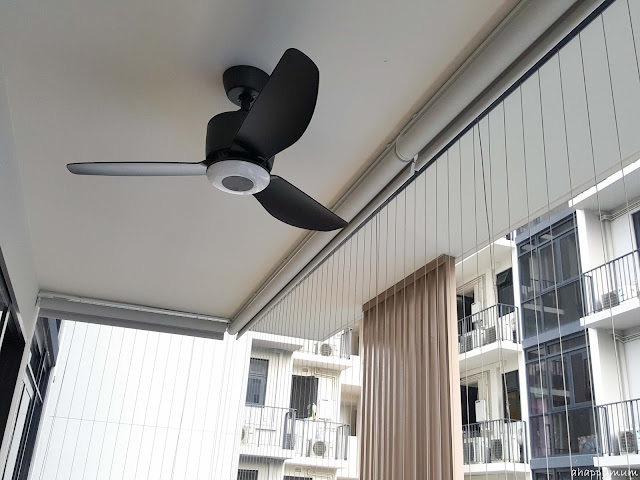 We also installed these for the in-laws' studio and let's just say that both my mum-in-law and I are way relieved that we have these because it's been raining nearly every day and we can't imagine not having these functional blinds which help to protect and keep our laundry and belongings as dry as possible. 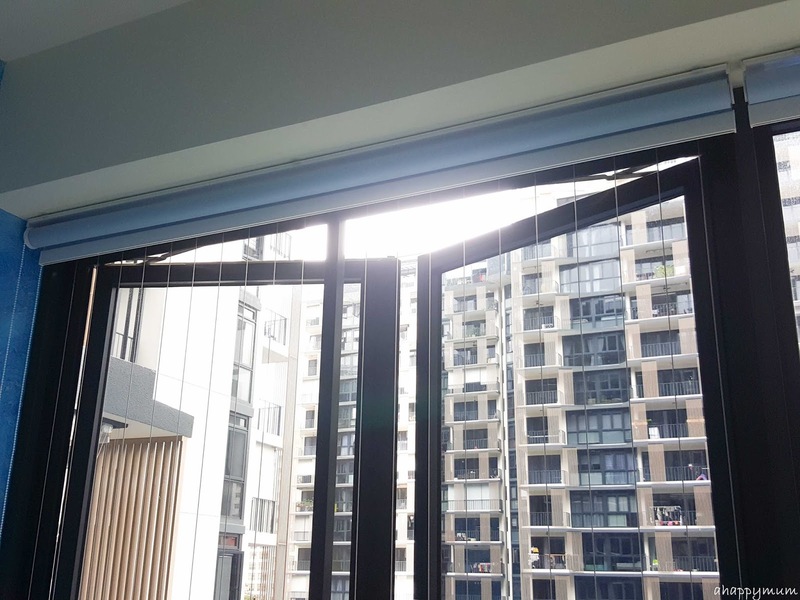 We only have two roller blinds for the front part of the balcony so each one is considered quite long at over 2 metres each. What I like is that despite the length and weight, the strings are not hard to pull so even the kids can help me to draw the blinds whenever we are heading out. Moving onto the kids rooms, it's time for more blinds but now they come in colour! Yup, I decided that we will use blinds for the kids rooms because they seem easier to maintain and make the room look cleaner and neater too. For the boy's room (which functions as a playroom for now), we chose blue since the room has a blue feature wall (Read about our feature wall done using Nippon Momento Special Effect Paint here). 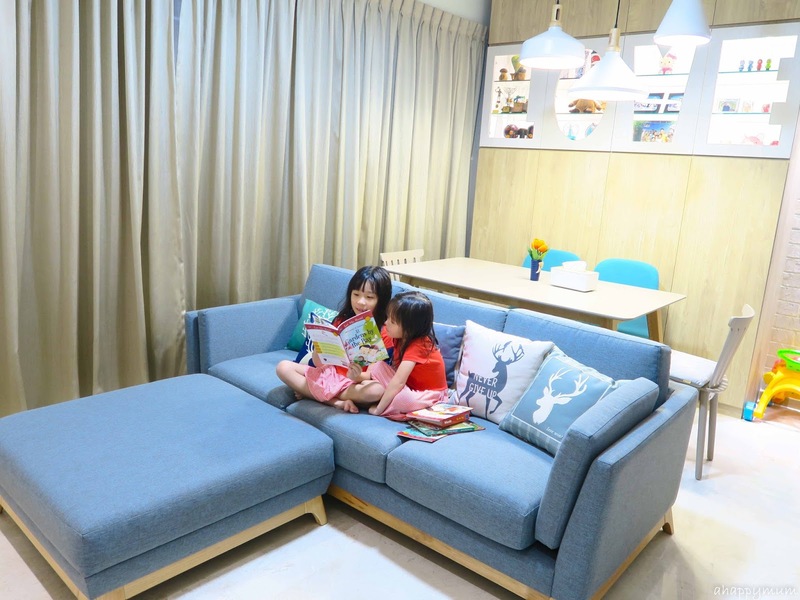 I thought that this pastel blue colour suited the room pretty well. As for the girls room, or what they now call the princess room, they wanted a pink blind to match their pink wall and thankfully there was a pink colour available - yes, just one shade of pink so it was a take it or leave it situation. Right, of course we took it. 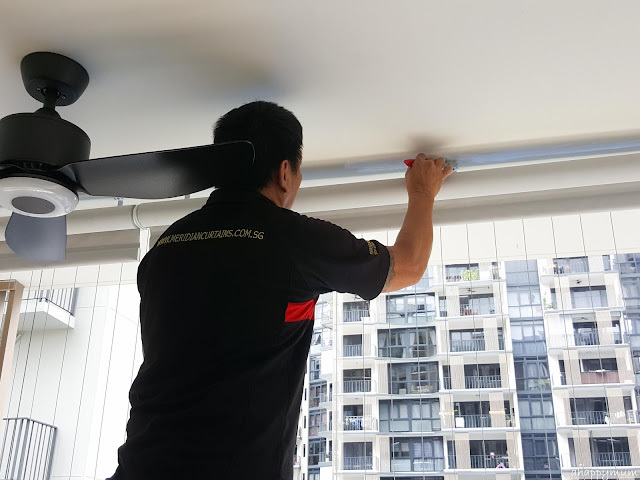 Installing the roller blinds in the bedrooms was a breeze and took just a short while to do the markings, drill and fix the blinds. 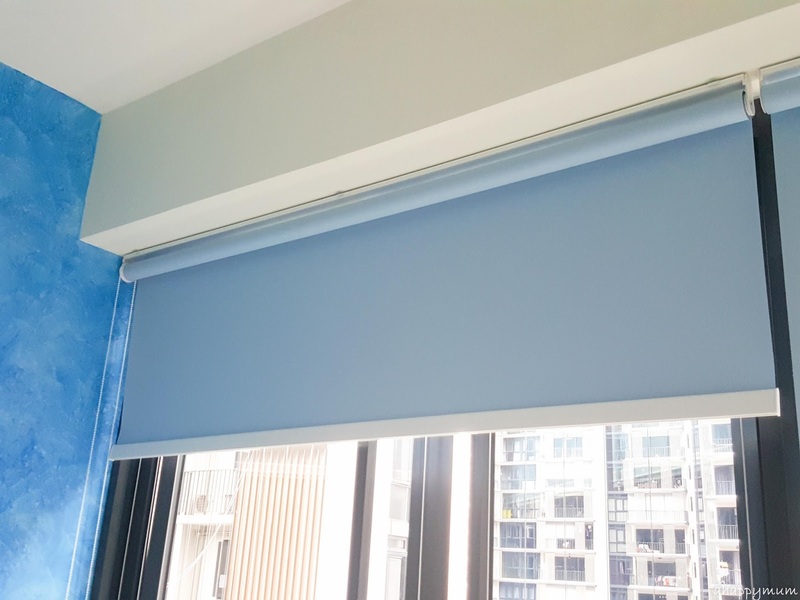 Do note that in case where you have to use more than one blind, they will be a small gap in between the blinds when drawn and the workers can only try their best to minimise it. Now, we move onto the curtains! Yes yes, I personally prefer curtains to blinds and so we did curtains for our master bedroom and the living room too. 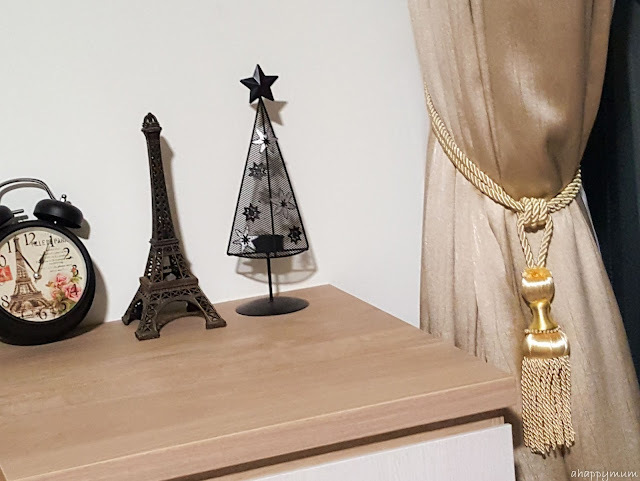 I'll be sharing more about our master bedroom in the tour post but here's a sneak peek - it has a grey/silver theme and so we chose a grey coloured night curtain coupled with a white day curtain. Day curtains are lightweight, semi-translucent and sheer in fabric while night curtains are made of heavier, thicker fabric which help to block the light and ensure privacy. The use of both actually allows us to optimise and control the light according to our preference and I love how I can also determine the amount of privacy I have (very important for a breastfeeding mum!). 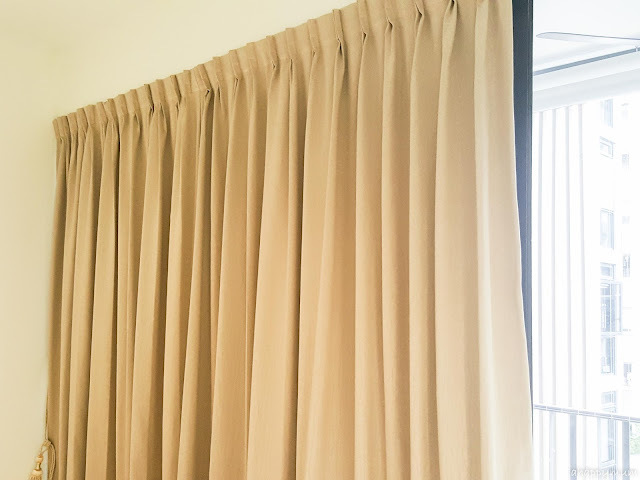 The curtains are hung up using plastic hooks, except for the first hook which is a metal one and the first eye is fixed so that the curtains stay in place. Are they easy to draw? Yes, so far we have no issue with them and are happy with the workmanship too. While it was hard to pick our favourite from the catalogues, we were really glad we chose what we chose! Lastly, for our living/dining room, I wanted a colour to match our Scandinavian theme which is made up of wooden laminated furniture. We decided on this light brown, rustic colour from this catalogue which we were told was rising in popularity recently. Not a bad choice, I suppose. It turned out just the way we wanted and I loved how plain yet elegant it is, perfect for a minimalist but functional Scandinavian themed home. The light colour matches our marble flooring and wooden furniture (which you will see in the tour soon) and we are also satisfied with the quality of the fabrics too. As for the curtain tie backs, Meridian provided us with these classy, beautiful gold tassels which I'm in love with. I personally think they look better and sleeker than using the same fabric as a tie back. So, here's a sneak peek at our living/dining room which I will be sharing more about very, very soon! 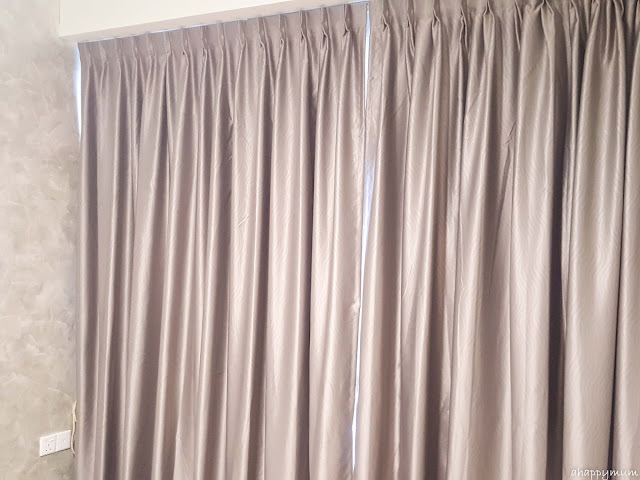 For now, we are happy with all our curtains and blinds which help to provide protection, dim the house, beautify the rooms and give us the much needed privacy too! To end off, here's a video to show you more about the installation process and end outcome. Disclosure: This is a partially sponsored collaboration between Meridian Curtains and Furnishings and A Happy Mum. 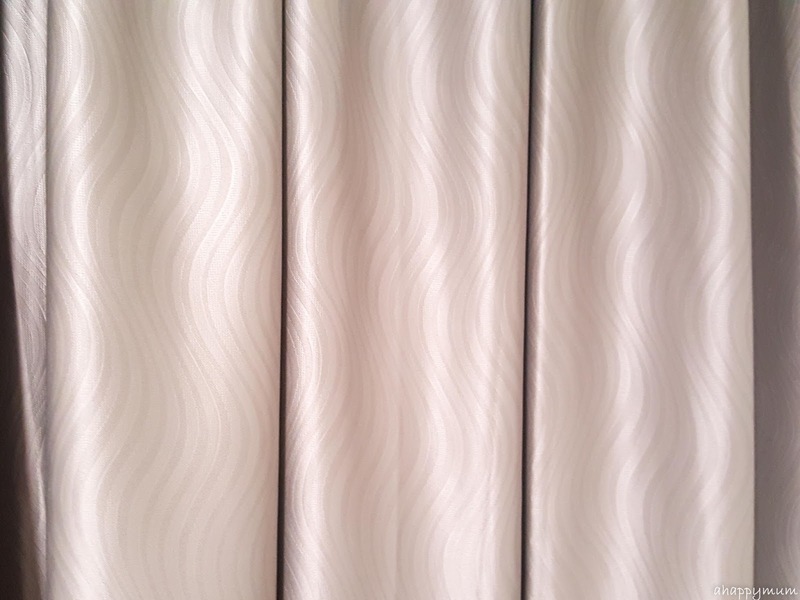 We received a special discounted price for the blinds and curtains in return for this review. All opinions are my own.